I’m constantly in awe as I travel the Ring Road around Iceland. For one thing, I can’t drive for a mile without seeing a waterfall, whether up close and personal or in the distance. At one point I counted six waterfalls in one view. Iceland has to be a geologist’s or a vulcanologist’s Valhalla. 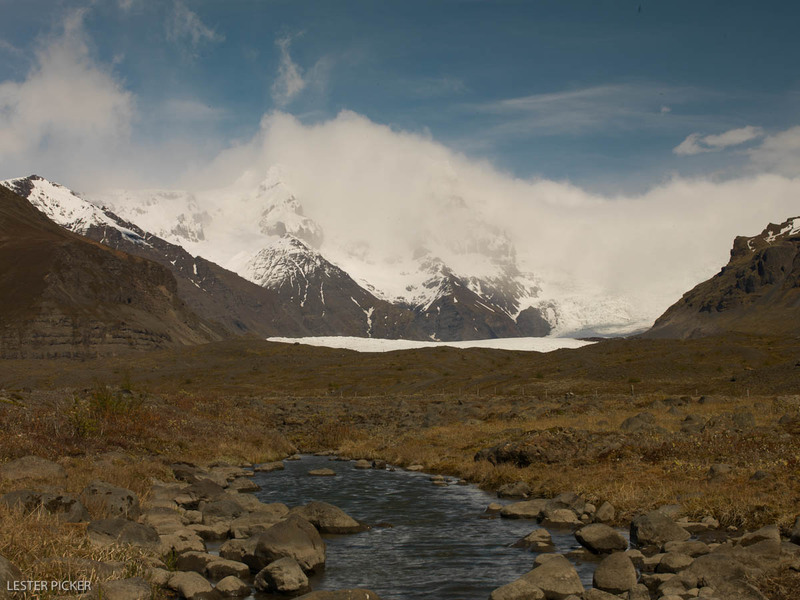 And if not seeing waterfalls, one is nearly always in sight of a glacier. Some sit atop Iceland’s many mountains. Others have accumulated enough mass to advance down valleys in their unstoppable flow to the sea. 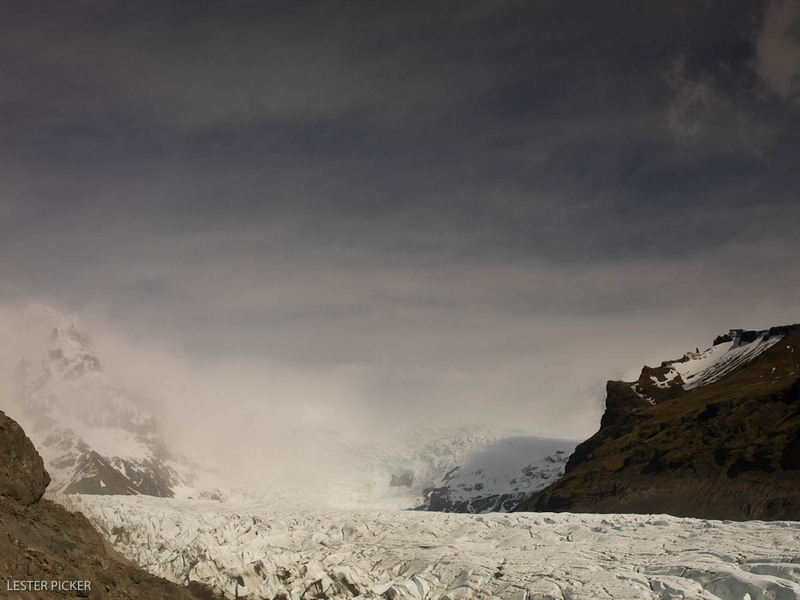 Iceland’s glaciers are both magnificent and frightening. As the glaciers advance, they scour the land before them, toppling trees, grinding boulders to gravel, and pushing millions of tons of earth before them like a bulldozer. Here is a scene at the Svinafellsjokull glacier along the south coast of the island, showing the advancing edge of the glacier with some of the earth it has scoured in its path. Richard Hartmier, my photo buddy from Yukon, Canada, and I stopped at the glacier for a photo shoot. The wind was blowing mightily and we had been warned that a storm was approaching. Richard went off on his own to photograph the icebergs that slough off the glacier and accumulate in a deep meltwater pond in front of it. I chose to climb the ledges on the left side of the glacier that you see in this picture. I managed to get a semblance of the shot I was looking for, but not without some drama. The winds were gale force, so I opened my tripod as wide as the narrow ledge permitted me to in order to stabilize my setup. I took off my backpack, which weighs about 30 pounds, and hooked it to the underpart of the tripod to add mass and further stabilize it. I began to shoot, but the winds suddenly picked up to hurricane force (75+ mph), nearly toppling my tripod and ripping my neutral density filters from my hand. At that time it was quits for me and I struggled to get my gear packed without being blown over the precipice. I would have liked to stay longer, even climbing higher to get rid of the rock on the left side of the image and getting a view of the entire snow-capped mountain, but I also wanted to live to tell about it, so prudence won out. In this image you can see the winds blasting snow from the glacial pack and barreling them down the valley. To give you all an idea of how strong the wind was, I did a tiny video clip of Richard when we stopped at another part of the glacier. Now Richard is not a little guy and he was almost toppled by the gusts at various points during the day.